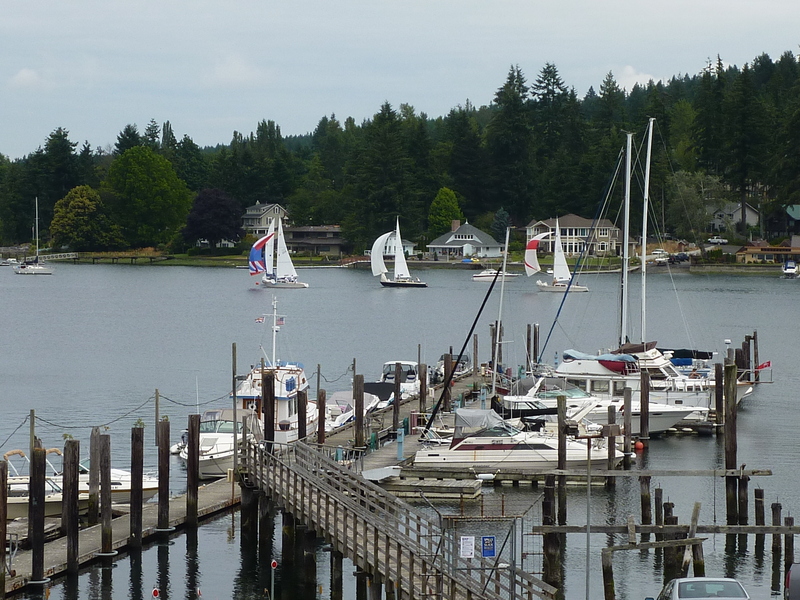 An essential Northwest experience IS crabbing (and boating) in the Puget Sound. It will be a day that you will remember. It is fun and can be a learning experience too. I know I learned about buoys, what makes up the food/bait, traps, and that if the crab is female or if it is under the size limit, then the crab should be returned to the waters. I also found that others take crab that are not their own…very bad! 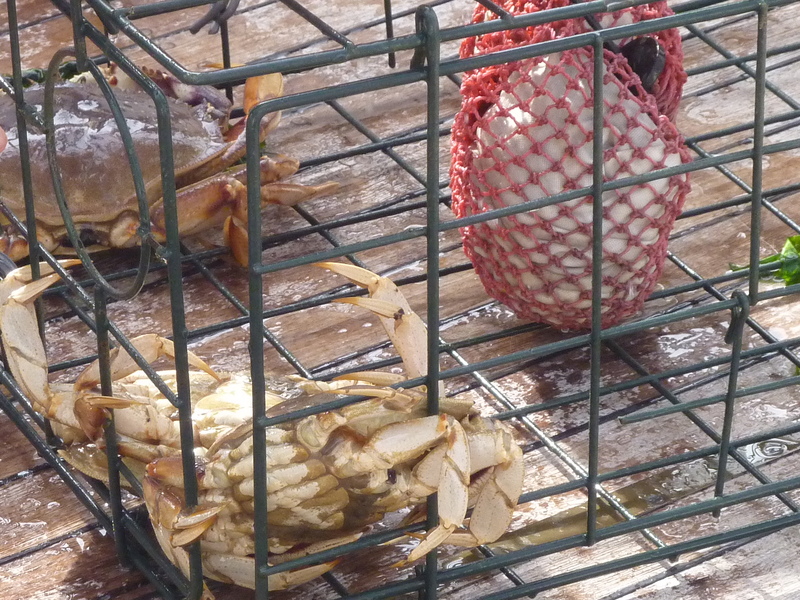 There is a limit on the number of crabs that can be taken per day during the season and on this day, it was five. The season for area 8-1 (Deception Pass) currently is open Thursday through Monday and runs through September 5th. Check out the following site for more interesting facts (and rules) on crabbing in the Puget Sound area: http://wdfw.wa.gov/fishing/shellfish/crab/. Go crabbing with a few friends and bring along some good food and wine (for those not driving anyway). And if you don’t own a boat, there are services that will allow you to partake in this pleasure. They will take you out in a boat, you’ll catch the crab (no experience necessary), bring you back to the shore and then it’s off to cooking the crab. An example of this is U-Catch Crab Feast from Camano Culinary Creations http://camano-culinary-creations.com/UCatchCrabFeast.aspx. 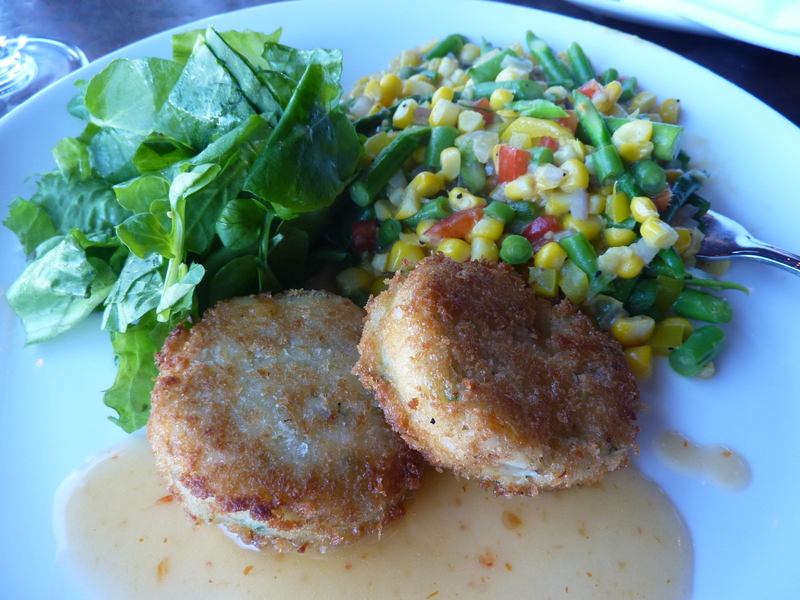 In one word, feasting on the Dungeness Crab right after it has been caught – YUM! If you are curious on how to crack crab, take a look at this – http://www.oregondungeness.org/cracking.shtml I know I will be studying this prior to my next adventure with crab. Anthony’s Restaurants have made a hit of this location and concept on Q Street in Anacortes, WA. Opening last year, the decor and food is all Northwest! 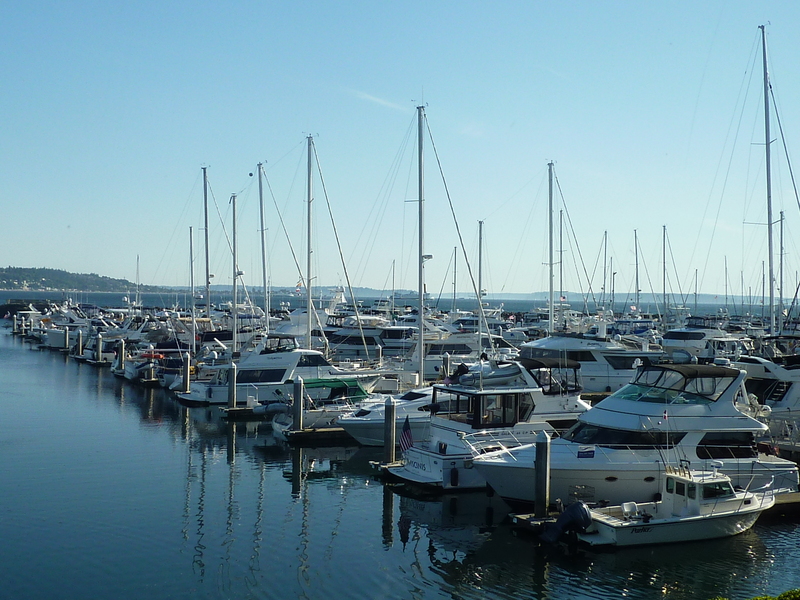 Located near Rose Point, Anthony’s at Cap Sante Marina offers guests an impressive view of the marina and boating activities year round. Two different outdoor dining experiences can be had and on a Sunday in August, lunch was enjoyed by the fireplace on the covered outdoor deck. The atmosphere really enhanced the experience (the weather was balmy, all were relaxed). Brunch is also served on Sunday. 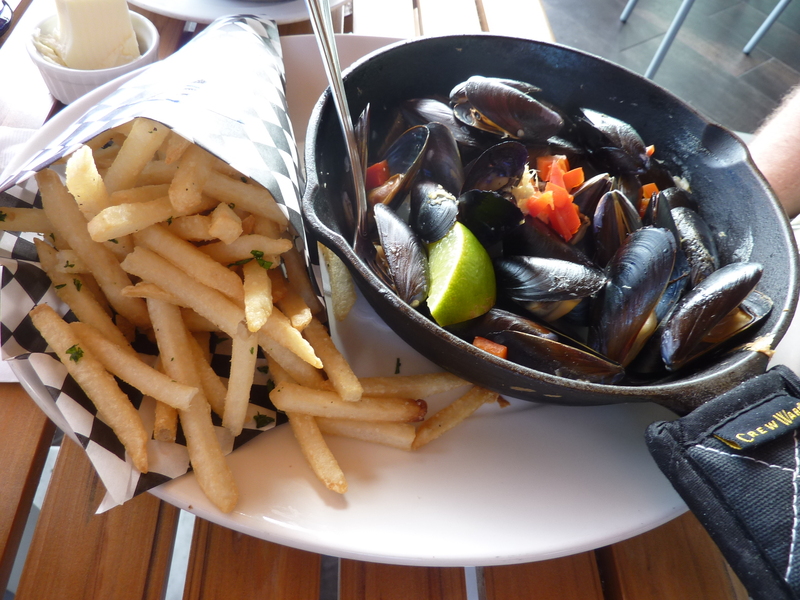 Choices made this day were satisfying no doubt: Penn Cove Mussels & Fries (traditional or ginger sake) and a Northwest Cioppino & Caesar Salad. 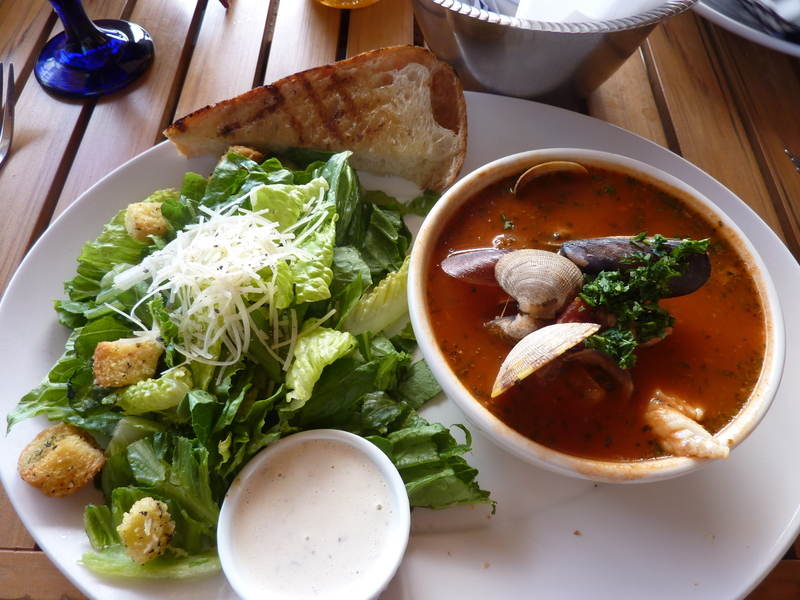 The Cioppino consisted of Wild salmon, Manila clams, Penn Cove mussels and Alaska cod in specially seasoned tomato-basil sauce. Order some bread to go with and top it off with a tasty beverage. Which National Park is most beautiful? Well, that is a tough one as they all have something unique that makes them spectacular. Mount Rainier National Park is one of those. On this day, the beauty of this mountain and park shined! The park is a 2-1/2 to 3 hour drive from the Seattle area. There are different routes and stops to make, like Paradise on the west side, Sunrise on the east, and more. This trip was limited to Paradise, so that is what I will be making note of. It is best to get there earlier in the day as parking tends to fill up during the summer months. But don’t worry, there are shuttles and other options as people come and go. The new visitor center is a nice stop and the Paradise Inn was recently renovated. You can go just to visit the Inn and walk the trails at Paradise or you can go for an all-day hike…like Comet Falls, Mowich Lake, or the Wonderland Trail which encircles the park. 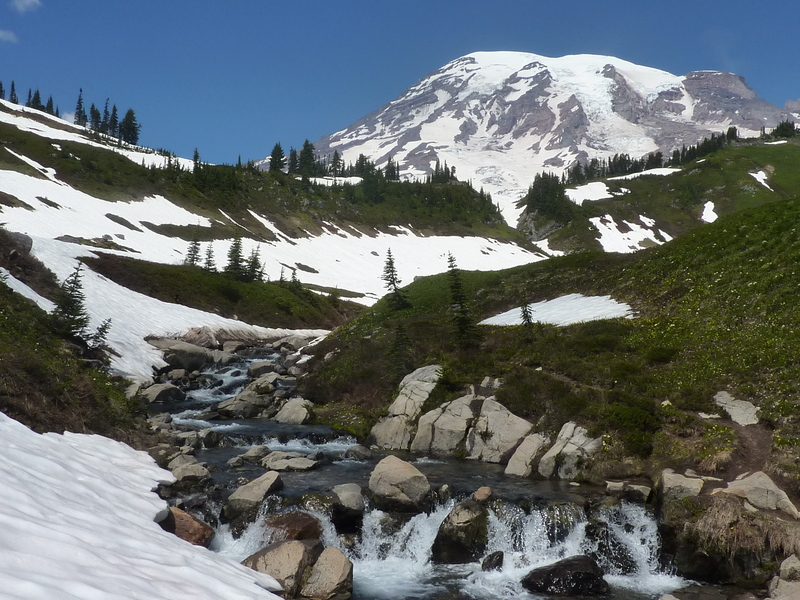 Mount Rainier is also known as prime training grounds for mountain climbers. You may want to stay the night, whether it be at the Paradise Inn, lodging in or outside the park, or maybe you like to camp…it has that too! I have camped at both Cougar Rock and White River Campgrounds. It is fun to look out for the numerous wild flowers depending on the time of year you go. Normally, the snow levels are high enough that you wouldn’t reach snow, even at 6800′, but this year, and here it is mid-late August, there is still a heavy snow pack on much of the trail system. Oh, and in the wintertime, there is snowshoeing. The only wildlife seen this time were the insects (but it isn’t that bad). Wear and/or bring the sunscreen and bug spray. The waterfalls were rushing. On the way “down the mountain” stops were made at both Narada Falls http://en.wikipedia.org/wiki/Narada_Falls and Christine Falls http://en.wikipedia.org/wiki/Christine_Falls. Both of these allow for a quick walk/short visit. Summertime in the city is always a wonderful time…go out and experience it while it lasts! 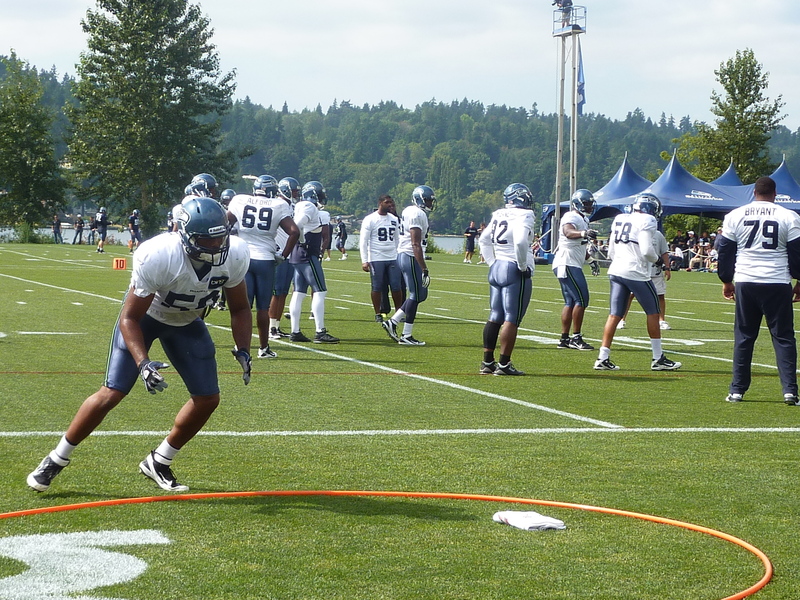 Since the new VMAC (Virginia Mason Athletic Center) was built on the shores of Lake Washington in Renton, WA, the Seattle Seahawks have opened up practice/training camp to the public. This year there are 15 practices between July 29th and August 15th. It is a nice opportunity to see the new recruits and veterans get ready for their upcoming NFL season. You will see a scrimmage and drills. The practice lasts about two hours and possibly a bit longer with the signing of autographs. 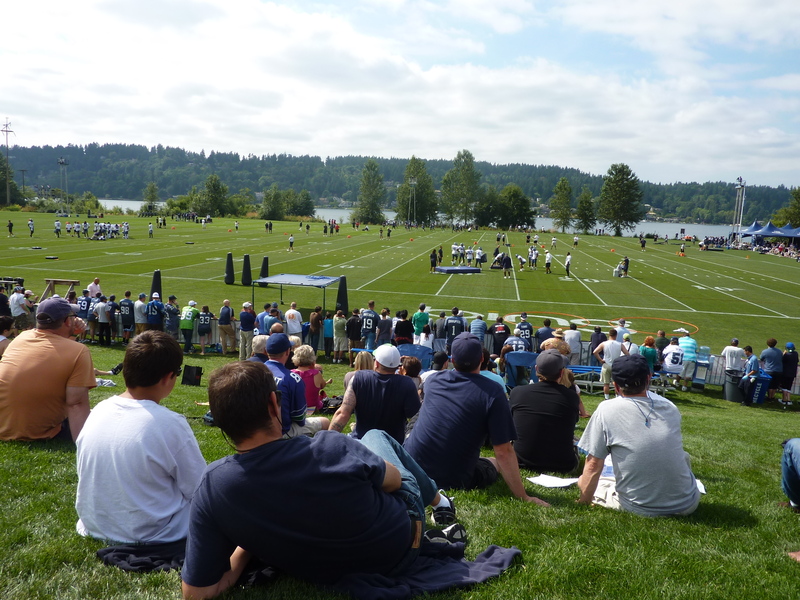 You must register at trainingcampregistration.seahawks.com and only those who register will be allowed at camp. At registration, you will be charged a $5 transportation fee. Chairs and snacks may be brought in, with restrictions of course. There is merchandise and also food and beverages available. Sports Authority offered a $10 coupon for anything purchased over $25 there at the complex. We indeed made use of this. Park at The Landing in Renton (3rd and 4th level of the parking garage) and take the shuttle buses to and from the event. They have the process down well…you will check in at the Landing prior to boarding. This is a nice afternoon for the kids, family, and friends! 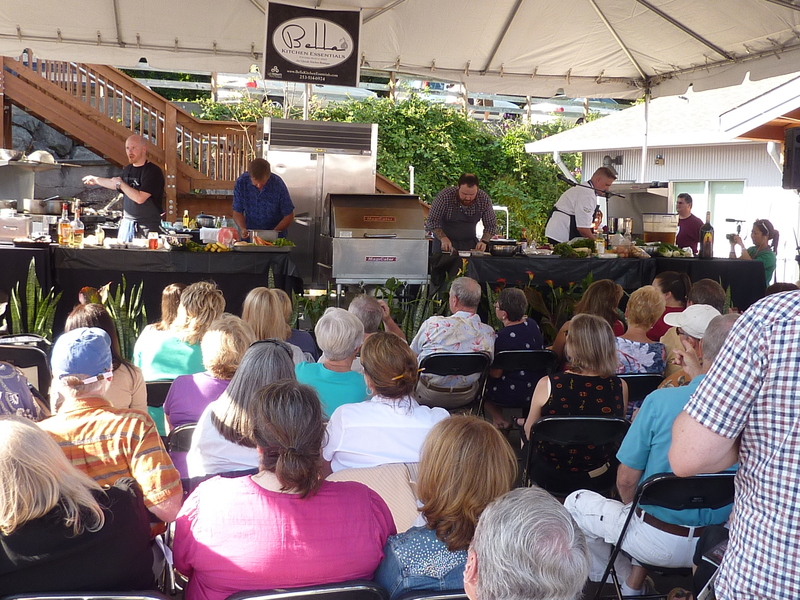 This year, the visiting Celebrity Chef was Chef Kevin Gillespie, a 2-time semi-finalist for the James Beard Foundation ‘Rising Star Chef of the Year’ award, a fan favorite of Bravo’s “Top Chef” season 6 and executive chef and co-owner of the Woodfire Grill in Atlanta. He took part in a cooking demonstration, the chef cook-off, and also signed books during his time here. Celebrity Chef Thad Lyman of Brix 25 was a big part of the day along with Chefs Jasmine Biernacki (Piece of the Earth Farm), Chef Jeremy Barber (Horseshoe Lake Golf Course) and Chef Tin (Clearwater Casino). My favorite restaurant sampling served was the Wild Boar Bourguignon from JW (Jason Winniford) and humble cook Justin Goodfellow…delicious! http://www.jwgigharbor.com/ There were wine and beer classes along with other interesting seminars… like “What’s in your Basket?’ And the wine? it was good to try a few of those that I had not yet heard of, although there were many more that I did not get to.